We have been following the development of a couple of new mid-range smartphones from Samsung. There have already been countless leaks related to the Galaxy J6 and the Galaxy J4. We exclusively leaked live images of the Galaxy J6 just a few days ago and the pace of other leaks suggested that the official launch wasn’t that far off. Samsung has now started sending invites to the press for an event on May 21. The event will take place in Mumbai, India and its where Samsung is likely going to launch the Galaxy J6 and Galaxy J4 officially. 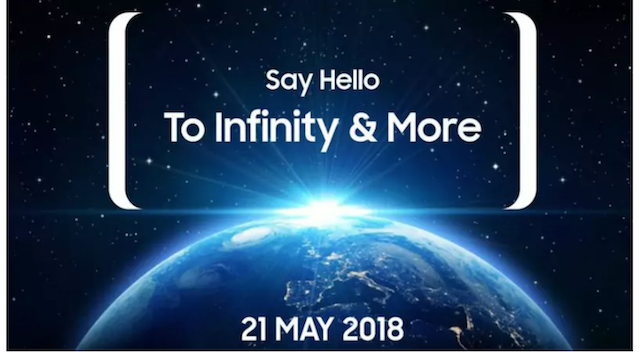 The event invite comes with the “Say Hello to Infinity and More” tagline which points to the fact that at least one of the two devices has an Infinity Display. We already know that it’s the Galaxy J6 that has an Infinity Display, albeit a flat panel. We exclusively revealed the specs of the Galaxy J6 and Galaxy J4 last week. The Galaxy J6 has a 5.6-inch AMOLED display with an Exynos 7870 processor and up to 4GB of RAM and 64GB of storage depending on the market. It also features a 13-megapixel rear and 8-megapixel front camera with an LED flash for each, LTE, dual-SIM support, a rear-mounted fingerprint sensor and a 3,000mAh battery. It will ship with Android 8.0 Oreo. The Galaxy J4 will not have an Infinity Display so customers will have to make do with a standard 5.5-inch display and it’s not clear as yet if it’s an AMOLED or LCD panel. It will be powered by Samsung’s Exynos 7570 processor with up to 3GB of RAM. It features a 13-megapixel rear and 5-megapixel front camera with an LED flash next to both, LTE and dual-SIM support and a 3,000mAh battery. It will also run Android 8.0 Oreo out of the box. It’s also expected that Samsung India will be confirming the pricing and availability for the mid-range Galaxy A6 and Galaxy A6+ which were recently announced by the company. Stay tuned for all of the updates from the event on May 21.